Rosy Outlook: Pretty Polka Dots + FF Link-Up! Pretty Polka Dots + FF Link-Up! Happy Wednesday! Hope y'all are having a great week so far. Ever since getting back last week work has been pretty insane but at least it's making the days fly by! Steven also started his new job yesterday so that is exciting. It was nice having him home with me during the day but now it's back to being just me and Toby as my officemate! I have been polka dot OBSESSED lately. Everything I see that comes in polka dots I want to add to my wardrobe--it's getting a bit ridiculous. I was so excited when I saw this top and that it was discounted! It kept selling out and I just kept checking the site over and over again until it was back in stock. Unfortunately, I do think the white is sold out again but I also linked to the black version which is SO adorable too and some sizes are still in stock! I swear you should moonlight as a model!! Sooo pretty, just love the polk dots! That one shoulder top is so cute. I am loving this trend and hopefully will keep seeing it into the fall. Polka dot party perfection!! I love cute dots for summer! 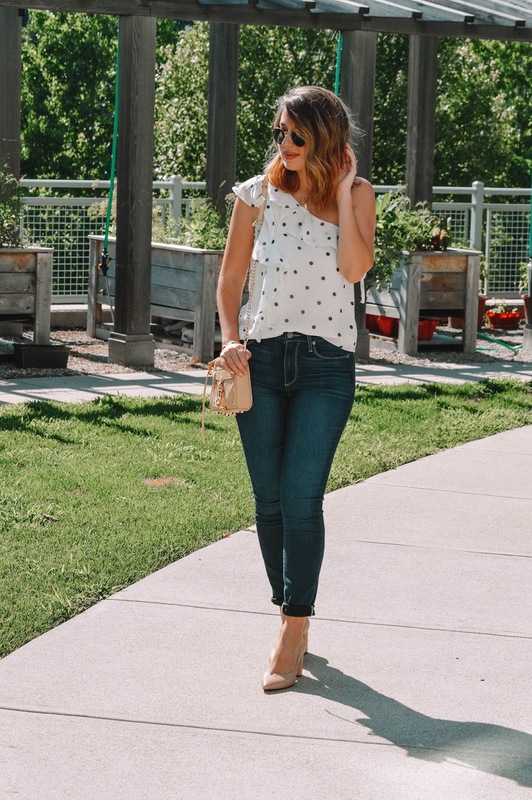 Polka dots are so fun, especially for summer. This tip is so fun and I love how you styled it. Such a fun flirty top! I always love a good polka dotted item! Linking up my polka dot swim suit today. What a cute little date night top! I love the polka dots! You are too cute in this polka dot blouse! Love it! Love your showcasing of this fresh and pretty summer top against a denim backdrop. X.
I cant get enough of this top! The polka dots are adorable and so is the off the shoulder! Thank you so much for the feature this week! 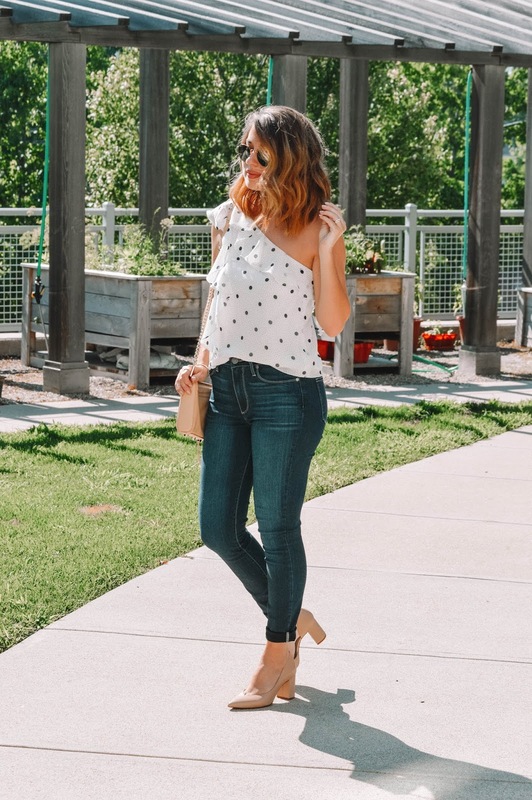 This polka dot top is so lovely! You're so pretty! I love this top!! You just can't go wrong with polka dots!! I adore your polka top .It is so cute with the cut of one shoulder along with the ruffle. It makes extra special. Has anyone ever told you, you look like Priyanka Chopra? You really do! Pretty indeed! Looks so chic on you dear. I love the one-shoulder style, and that polka dot print is such a classic.